Before we moved, we lived in a 900 sq. ft. duplex with a multipurpose kitchen that served as our cooking room, dining room, home office, and school room. When we bought this house we added about half again as much living space. 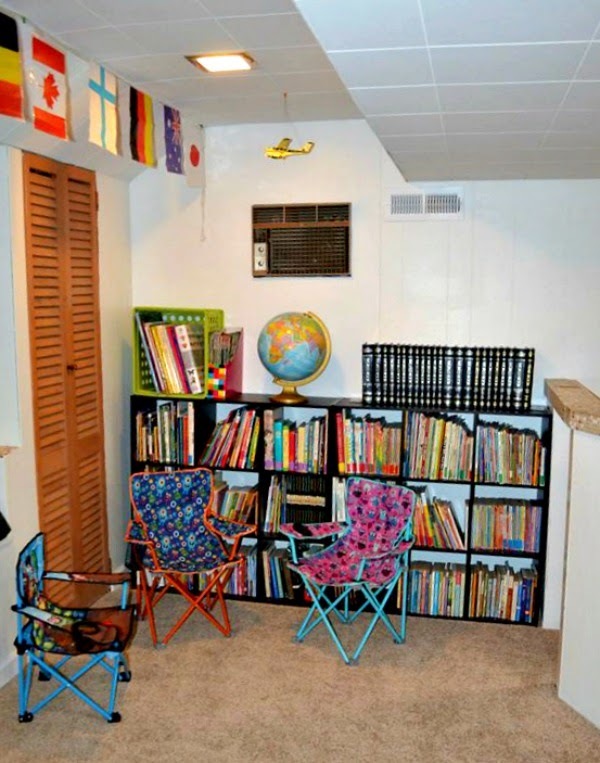 The kids now get their own bedrooms and though the kitchen is smaller now, we gained a finished room in the basement that has been turned into a family room/school room! On one end of the room is a bright fluorescent light in the ceiling. I positioned our table near it because it lends itself well to bookwork. We all sit at this table when we need to fill out worksheets or write or draw or color. There is built in storage behind the table that we use to corral all our school books for the year. We haven't implemented workboxes since the move and might not since things have been working so smoothly for us so far this year. Hubby's treadmill is down there which is nice when it's bitter cold outside and one of the children need to burn off a little energy. Just past the treadmill along the same wall is a little folding table I covered with a pretty cloth and positioned a TV/DVD player on a lazy susan. Hubby turns it toward the treadmill when he runs and the kids turn it toward their beanbag chairs on the floor when I have a DVD from the library for them to watch. This is a new addition to our routine and we love the cozy feel of it! I often find Miss M camped out with her books at this table instead of our main one. The lighting isn't as good, but I think she likes having a sort of walled-in feeling to help herself focus on the task at hand a little better. Otherwise she tends to get off task a bit too easily. 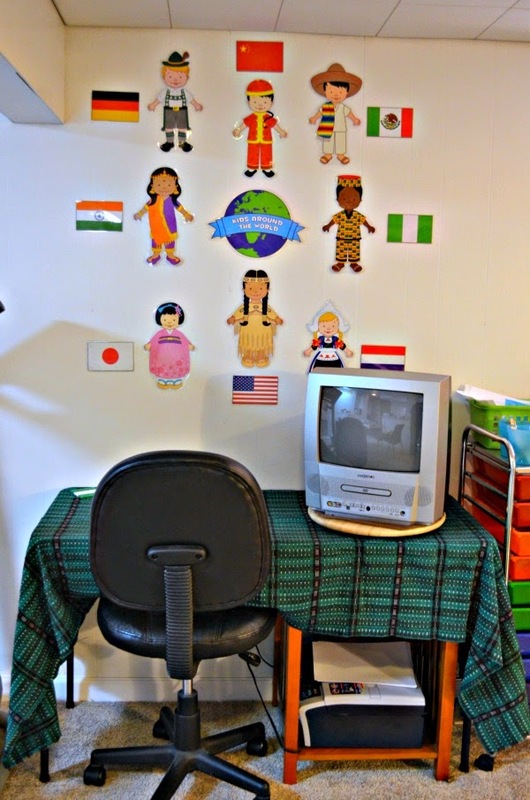 Of course, I couldn't let a perfectly good white wall go to waste, so I put up our adorable kids from Oriental Trading. On the opposite side of the room from the treadmill and TV table there is a wet bar. 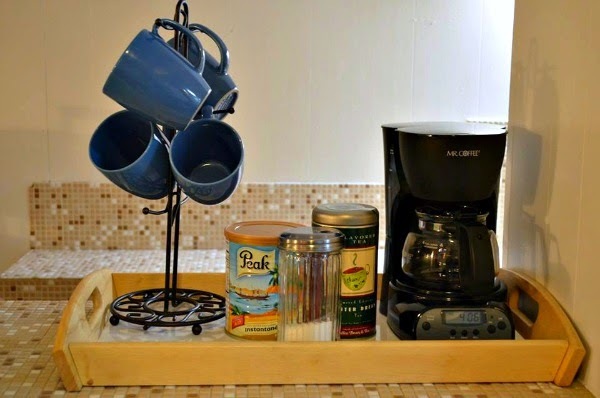 Now this was always a little amusing to us from the first time we looked at the house because we don't drink, but hey, as homeschoolers having a wet bar is awesome! Instant science lab and art center, right? We're using a portion of the bar as a little tea center! Every morning when we come down into the chilly basement, there is a fresh pot of hot tea brewed and waiting for us. It's utter luxury! And it's something special that the kids look forward to. The bar countertop is divided by a support pillar on which I affixed our trusty whiteboard. 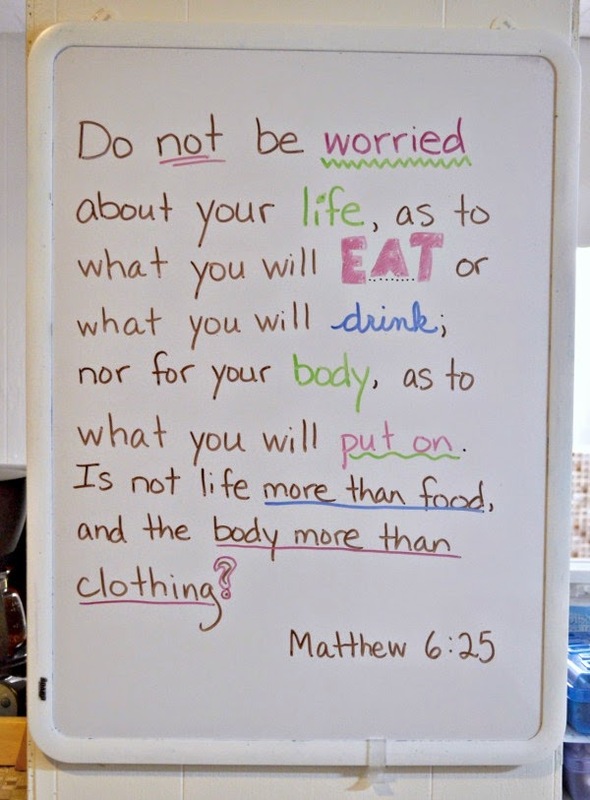 On it I display our memory verse for the week, and occasionally solve a math problem or two. Behind the bar is a bunch of built in storage space. In fact, in the whole room there is a bunch of built in storage space (score! ), but let's first take a peak in the storage behind the bar. That is where I keep all our office supplies, school supplies, and basic craft supplies. 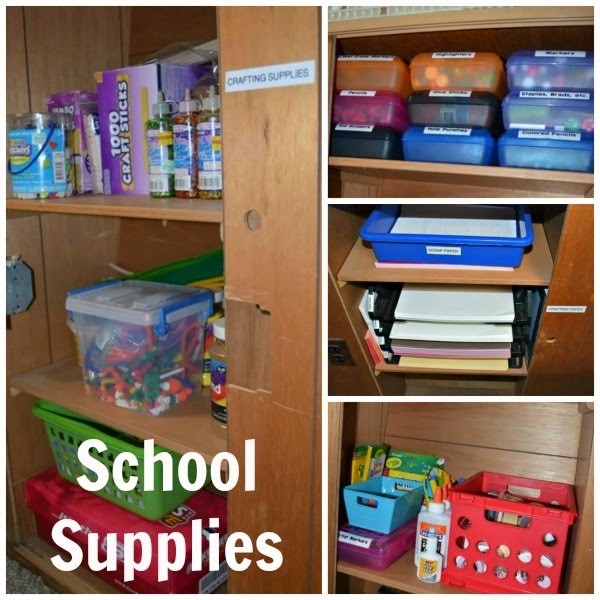 You'll find pencil boxes of markers, colored pencils, glue sticks, safety scissors, and more. I have stacks of papers, bottles of glue, glitter, craft sticks, pompoms, and the like. Everything is neatly labeled with my handy labeler and so far it has remained fairly tidy in spite of heavy use by two artistically inclined kiddos! Now we're coming to the best part of the whole room! 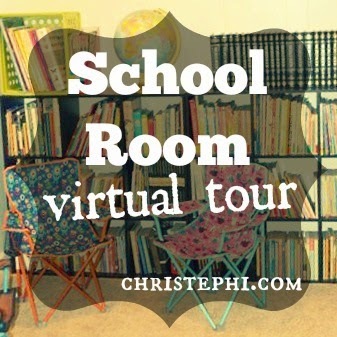 It's an awesome built in nook complete with a mountain lake background scene. There is storage space beneath the seat and in closets on both sides. One closet holds all our board games and the other holds various less frequently needed homeschooling paraphernalia. 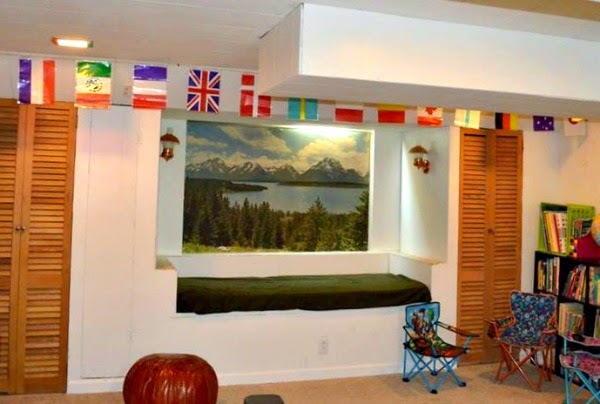 The ceiling slopes down just before the nook making a perfect place to hang our flags of the world! I've been stalking Target's clearance section to get more pillows because every reading nook needs a plethora of plump pillows to make it more inviting. 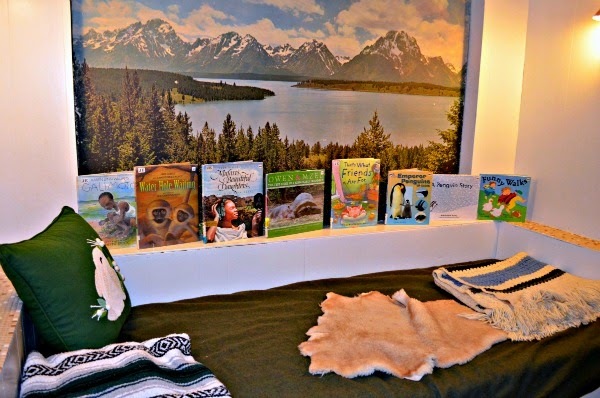 One thing I've always wanted was a place to display some of our library books to tempt the kids' reading appetites rather than only having them available inside a box, basket, or crate. The past few weeks I've been putting a few choice titles on display like this and it has been a huge hit. Not only do the kids gravitate toward them, but they make comments about how the cover looks uninteresting, but they read it anyway and find out that the content is wonderful. If that's not a win, I don't know what is! To one side of the book nook is our children's library. I put two 9-cube shelves side by side and arranged our collection of reference books and kids books there. They are roughly arranged by topic with science in a group, social studies/geography in a group, etc. I set up some little camp chairs, but eventually I'd like to put some big beanbags or lounge pillows there in their place. 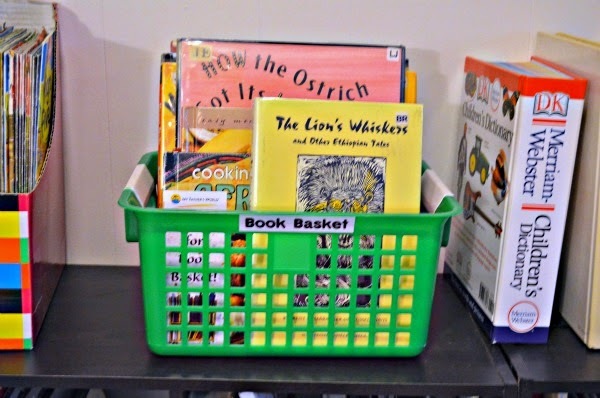 Our curriculum recommends the use of a Book Basket™ to "spread the feast" of books for the kids. This gives them exposure to various perspectives on the topics we are studying at a given time. I have two Book Baskets, one for Mister E (kindergarten) and one for Miss M (4th grade). The one I use for kindergarten is actually a cheap wire dish rack. I like it because it separate the books with the little wire dividers making it easier for the little Mister to see what's there and removes frustration in trying to get out the ones he wants. Miss M's book basket is a little more traditional -- an actual basket marketed for use by libraries. It sits up on top of one of the 9-cube shelves. 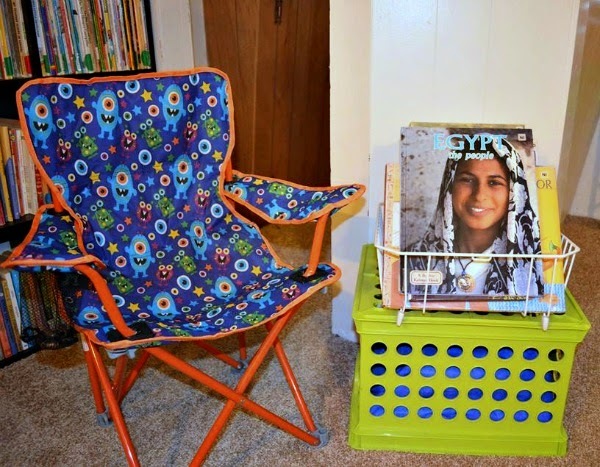 These baskets typically hold books from the public library, but I do sometimes toss in some of our own books and magazines and even the occasional DVD. And that is our school room! 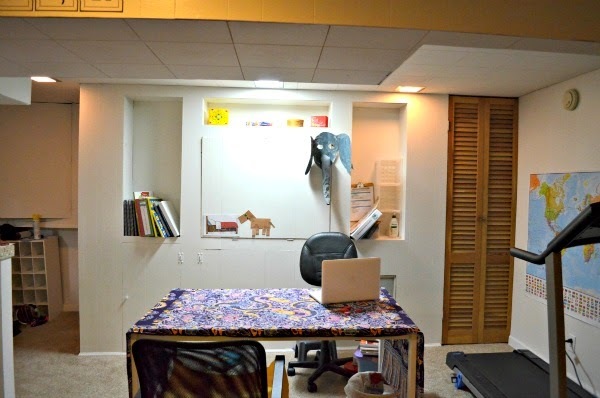 It probably won't look exactly like this for long because like most homeschool spaces, it is constantly evolving to meet our needs. The biggest boon to having a dedicated school space is that when lunchtime comes we can literally leave behind our work, spread out as it is, go upstairs and eat lunch, then return and get back to work. Whereas before, by necessity, we had to pack up and put away our school work in order to eat at the same table we were schooling at and then pack up and put away lunch before redeploying the books after lunch! Besides, it's such a pleasant place that we all like to hang out down there even after school is over for the day!